"OMMM is the pseudonym used by a reclusive Tibetan guru linked to the ADAADAT label. Rarely seen in public, his devotional performance style and mysterious, shifting rhythms and harmonies have been known to drive worshippers into such a frenzy that they began to eat each other. Raw." 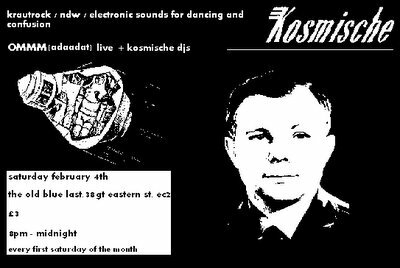 Kosmische parks the trans-europe express in Shoreditch, beaming freaked-out sounds from the further reaches of the universe to the upstairs of The Old Blue Last. Brains will melt to the sound of the impossible, from Amon Duul to Boredoms via Kraftwerk, Neu!, Sun Ra, Throbbing Gristle and beyond. 38 Great Eastern street, London, EC2A.